Hands off Tim Hortons Workers’ wages and benefits! Happy New Year! 2018 began with Ontario’s minimum wage being raised to $14, which immediately increased wages for 1.5 million workers. The new year also began with some predictable but still shocking behavior by some businesses seeking to undermine the spirit of new labour laws meant to improve working conditions. 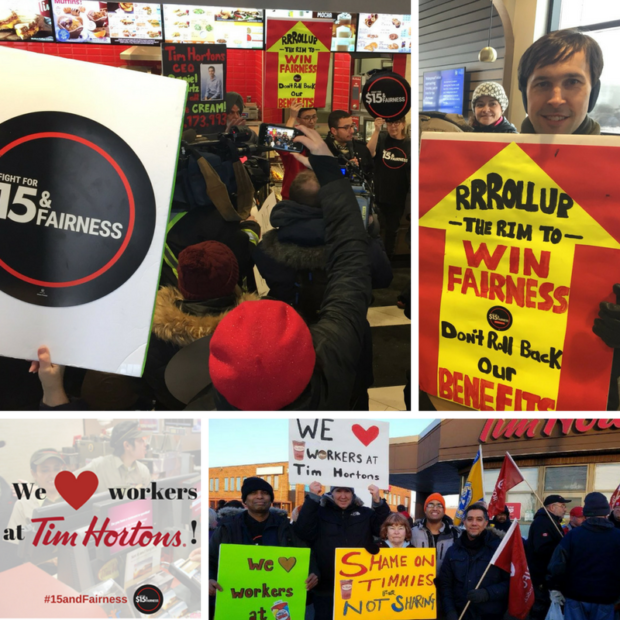 Tim Hortons stands out as a key offender with their actions against the new $14 minimum wage. News quickly emerged that the heirs of the original Tim Hortons founders cut benefits and paid breaks at their Cobourg franchises. Then news spread on social media about other franchises bullying workers by taking away tips, cutting hours and meal allowances. Workers have reported being made to sign gag orders preventing them from speaking out publicly about their worsening work conditions. Customers have been outraged by the actions of Tim Hortons and this has become an important struggle in the fight for fairness. To voice your own outrage, sign this petition in support of Tim Hortons workers. Actions were organized across Ontario on January 10 asking Tim Hortons customers to show their support for workers and voice their complaints to the company. On January 15th, a delegation of local leaders delivered a letter to the parent company, Restaurant Brands International, demanding action while a lively flashmob was also held in a nearby Tim Hortons to highlight the issues workers face. We need you to join us in continuing to put pressure on the company so that wages and benefits are restored to workers at Tim Hortons. You are invited to join us for our Stand with Tim Hortons Workers: Canada-wide Day of Action on Friday, January 19. (Find a location near you on Facebook.) In 2016, we know that Tim Hortons made $350 million in profit and can afford to pay its CEO, Daniel Schwartz, over six million dollars in wages and benefits. This is a highly profitable company that can afford to share its profit with their workers so they can live without poverty.